Creating a series of recurring live classes on a repeating schedule used to require cloning an existing class for every instance of that class. For those who want to quickly create a lot of similarly scheduled classes all at once, class cloning is a time-consuming process. 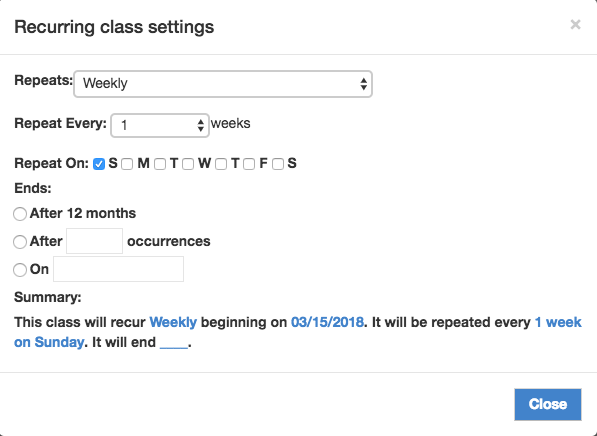 To make this task easier, we are adding a new enhancement to our live classes feature called recurring classes that allows admins to hundreds of classes on a repeating schedule. This feature works much the same as scheduling a recurring meeting in your calendar program. With this enhancement, as an admin, you can choose to create a recurring class anytime when they create a new live class. From there, you can select the start and end date, the repeating period of time, and the number of occurrences. With just a few clicks, you can now instantly create hundreds of classes that will all show up on the site calendar.